They say it’s better to give than to receive, but if you can also get a little something back when you give, what’s not to like? While there’s absolutely nothing wrong with tossing some cash to those bell-ringing Santas, there’s a better way to give. You see, giving to charity is one of the easiest ways to lower your tax burden, as long as you follow the rules and do it by Dec. 31. 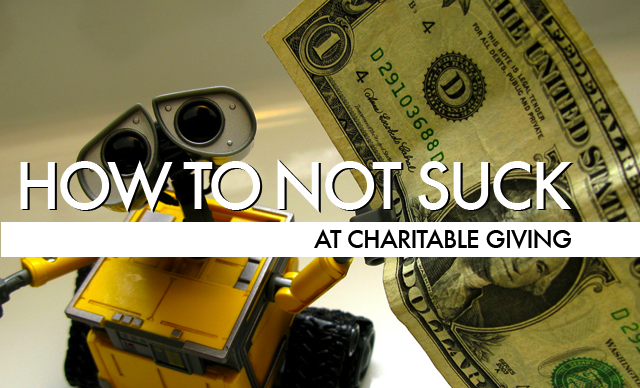 Here are 15 things to know to make the most of your selfish reasons for charitable donations. 1. In order to deduct a charitable contribution, you must itemize your deductions on Schedule A of your Form 1040. 2. You must give to a legitimate, qualified organization before the end of 2013 to take the donation on your 2013 return. Check that your charity is eligible to receive tax deductible contributions exempt with the Internal Revenue Service. 3. You can’t deduct contributions that you give to individuals, however needy, nor can you deduct donations to political organizations and candidates. 4. Some charities solicit bids on goods as fundraisers. If you received a benefit from your donation, such as concert tickets or merchandise, you can only deduct the amount that exceeds the fair market value of the item you received. 5. Speaking of fair market value, if you clean out your garage or closets and donate property, don’t expect to deduct what those items initially cost. Plus, clothing and household items must be in good used condition or better (who wants your old socks, anyway?) to be deductible. Refer to the IRS’ guide to properly valuing donated property. Also make sure your targeted charity actually wants the items you’re donating. 6. If you plan to donate expensive items such as antiques, artwork or medical equipment, pay for an independent appraisal. Once you give away the items, if the IRS questions their value, it will be too late. 7. The IRS has ramped up its checks on the fair market value of donated cars in recent years. Make sure you get a proper appraisal before giving. 8. If your total deduction for all non-cash contributions for the year is more than $500, the IRS requires you add Form 8283, (Non-cash Charitable Contributions), to your tax return. If your non-cash contribution exceeds $5,000, don’t miss Section B of Form 8283, and add that appraisal. 9. If you’re giving cold, hard cash, or a check, you’re generally okay with donations under $250, but make sure you receive a receipt. The IRS expects the paperwork to show the name of the organization, the date of the contribution and amount of the contribution. You’ll need the proof of a telephone bill if you’ve given via text message donations, but the bill will have to show the name of the receiving organization, the date of the contribution and the amount given. 10. If you give cash of over $250, the IRS says you’ll need “a bank record, payroll deduction records or a written acknowledgment from the qualified organization showing the amount of the cash and a description of any property contributed, and whether the organization provided any goods or services in exchange for the gift.” And if the total of all your cash donations for the year is more than $500, you’ll need to add IRS Form 8283 (Non-cash Charitable Contributions) to your return. 11. If you give your time to charity rather than cash, there are other deductions you can take. You can deduct $.14 a mile if you drive for charity, for example, plus tolls and parking costs. Make sure to keep good records. Think creatively and you may find many of your actions constitute help for charity, just know you can never deduct your time because you weren’t paid for it. 12. Rather than give cash or property, consider donating appreciated stock or mutual funds. The benefits to you are several. You won’t have to pay capital gains tax on the donation, and the funds from the sale won’t be added to your taxable income. And, you get the donation. 13. You can donate directly from your Individual Retirement Account (IRA). If you’re older than 70-1/2 and you must take Required Minimum Distributions (RMDs), you can donate the RMD directly to charity. It will count toward your RMD for the year and you’ll save on the taxes you would have owed on the distribution, but you cannot take a deduction for the donation. 14. If you’re in the money and plan to leave it all to charity when you bite the dust, consider starting a charitable remainder trust. You’d put your investments and other property in the trust, and you’d still receive income from the investments. When you’re gone, the charity keeps what’s left in the trust. 15. You can also contribute to a professional donor-advised fund, which allows you to take a tax break in the year you donate but you can dole out the money to charity later. Before you give, make sure the charity you choose is genuine and not spending too many dollars on administrative costs rather than helping those in need. Remember the Florida charity that collected $127.8 million in donations but used only $3.2 million for the dying kids it professed to support? Use the tools offered by CharityNavigator.org, GuideStar.org and the Better Business Bureau to do some sleuthing.